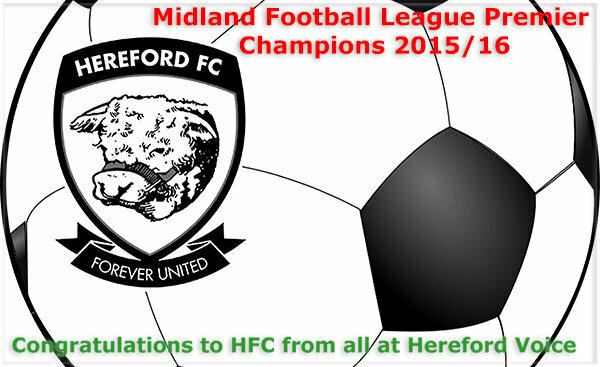 Congratulations to Hereford Football Club on an incredible season and winning the Midland Football League Premier Division trophy last night. 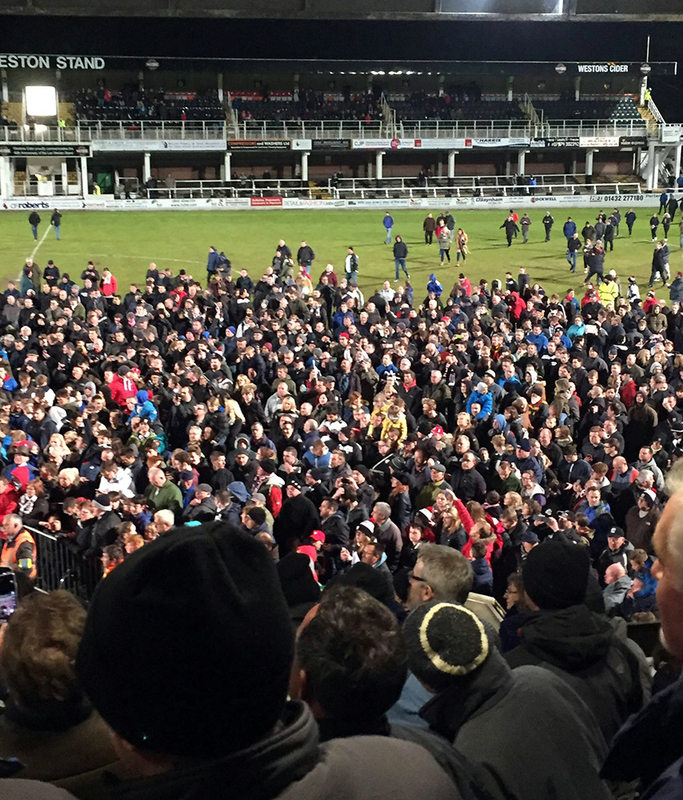 Hundreds of fans made their way onto the pitch to see captain Joel Edwards lift the trophy following the League Cup semi-final, second leg victory over Stourport Swifts. What an amazing achievement! Well done to all concerned. We now have a genuinely local team who play their hearts out. Three pieces of "silverware" to go! My husband is off to wembley to watch the vase final he has his ticket .He has said that the club has done so much to put this city on the map about time the council took note of it and what it really means by generating money for local business, ie my husband goes to the football i go and do shopping in peace. The away fans make a day out of it some make a weekend of it. Before the council decide to take anymore of the carpark think again. Not a football man, but today I felt dissapointed for the fans. UHFC are touring our city on Monday in open top bus to say thanks to the fans support this year, as most players will return to normal jobs on Tuesday. Despite the outcome at Wembley?! Real shame that many of the fans will also be at work on Monday and miss the parade. Why can they not do it on a Saturday/Sunday instead? Be a real shame for the fans. Throw a party on the meadows to finish up! Just saying! Did everyone see Hereford on local TV news tonight? they have now left for Wembley with Ronaldo seeing them off. The open top bus tour starts on Monday 12pm from Widemarsh Gate,along Widemarsh street ,and into High Town by Black & White house for photo shoot at 1pm. How many coaches in Hereford at 0630 this morning? Got to be heading for the 100 mark! Word on the street is Hereford alone sold 20K tickets!! Good luck Bulls. It's live on BT Sport if you are not aware. Shame they're proceeding with the Monday tour though. Some of us work. Sad news for the Bull's we lost 4-1, news reported on HT. Lets hope Hereford people still come out tomorrow to welcome them home. Hereford did the boys proud this morning giving them a grat reception in town and then went on to the Town Hall for a meal. I was fortunate to have my photo taken with the team at the Town Hall. It was all down to Phil Edwards I guess. 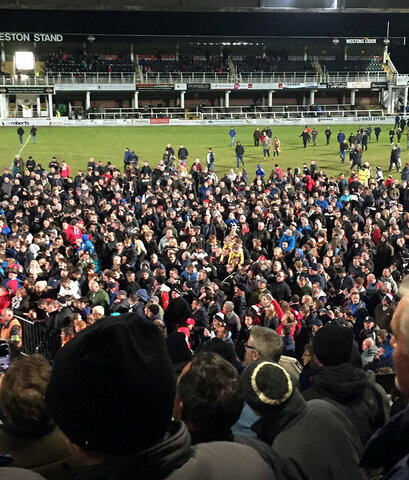 If he had been at Wembley rather than sat on his lawn mower then no doubt Hereford FC would have triumphed. As my husband said it was a great day out at wembley a story of 2 halfs could have been 3 up inside the first 20 minutes or should have been the noise the fans made was out of this world he caught the coach at ross at 0640 and got back home at 2040 long day but a memory that cannot be taken away. also Â£5 FOR A PINT Â£4 FOR A HOT DOG that is wembley glad he took his own food and drink. Hello ipusseycat, glad your husband enjoyed the day. So.... the question is, are you Mr Ipusseycat, or Mrs Ipusseycat.....or are you both commenting from the same account??? Back to the thread....although I've never been a fan of football, the team really have done our city proud. Congratulations to all of the players, club staff and of course, the supporters. A great season. AV..your comment above. Hilarious! Funniest thing I've read on here in a while! Perhaps we should change #find Phil to #blame Phil....!